ww2dbaseKatsuragi was completed near the end of WW2 when Japan had for the most part lost control of the seas, therefore she did not influence the outcome of the war in a significant manner. Her construction also reflected Japan's eventual fall. Her machinery was designed to use that of a cruiser's, but even with that, she had to be completed with destroyer turbines. The lack of steel meant she was not equipped with armored flight deck, like the rest of the carriers in her class, though since she was designed to be a convoy raider, armored flight deck was not completely necessary in the first place. ww2dbaseBeginning in Feb 1945, after the aircraft originally assigned to her were re-assigned to land-based units, Captain Masaharu Kawabatu began to camouflage Katsuragi. Like other carriers, elaborate models were constructed on the flight deck to mask the fact that they were carriers. False buildings, painted streets, and real trees were set up on her flight deck. On 19 Mar 1945, Katsuragi came under attack by American aircraft from Task Force 58 while at Kure, Japan. She was hit by either a bomb or a 5-inch rocket on the starboard bow, blowing a 5-foot diameter hole, damaging the flight deck and upper hangar deck while killing one crewman. This was followed immediately by a second hit, likely to be a rocket, on the port side of the flight deck; the second hit caused little damage aside from a small hole. A near-miss by a dive bomber caused some flooding in the air compressor room and the Number 8 fuel tank. On 5 Apr 1945, some of her personnel were transferred to battleship Yamato, though for the remainder of the war, despite never deployed to sea again, she remained fully manned. 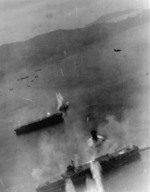 On 24 Jul 1945, Kure harbor was once again attacked by American aircraft, this time by those of Task Force 38. Katsuragi escaped nearly unscathed, possibly due to the elaborate camouflage. She was attacked the final time on 28 Jul 1945 when the aircraft of Task Force 38 returned. She downed one American aircraft, but suffered a direct hit by a 2,000-pound bomb in the hangar. No fire broke out, but the entire upper hangar deck and both elevators were heavily damaged. ww2dbaseAfter WW2, under the command of Captain Toshio Miyazaki who commanded her during the final four months of the war, Katsuragi was used as a repatriation vessel that transported Japanese troops back home. Damage caused by the 24 Jul 1945 was barely repaired as transport duties did not require her to have working elevators or a flat flight deck. Her post-war cruises took her to Minami Daito Jima, Rabaul, Australia, and other locations. After bringing home about 12,000 men from abroad, she was decommissioned at Kurihama, Japan in 1946 and scrapped in 1947 at Sakurajima Hitachi Zosen, Osaka, Japan. ww2dbaseSources: Imperial Japanese Navy Page, Wikipedia. 3 Oct 1944 Katsuragi was commissioned into service. 1 Apr 1946 Katsuragi was decommissioned from service. Katsuragi was equipped with destroyer turbines with combined HP of 104,000, giving the ship a speed of 31-32 knots. Sisters with 152,000 HP Heavy Cruiser turbines (Soryu & Hiryu, and others) had 34 Knot Speed.